Exchange our Splash Activity Vouchers against any of these activities. We run activities all year round and your activity vouchers can be used against any of our adventure activities. These include White Water Rafting on the River Tay or River Tummel, Abseiling, River Bugging, Canyoning, Stand Up Paddle boards, Duckies and more. 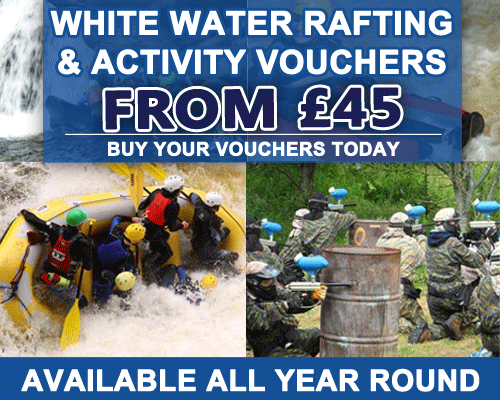 Buying Splash White Water Rafting and Activity Vouchers is a great way to budget. Our Activity Day vouchers can be bought all year round and they are valid for 24 months from the date of purchase. 24 Months is twice as long as our competitors as well as almost all other Experience gift voucher schemes. Start buying our adrenaline vouchers and surprise a loved one with the adventure of a lifetime and feel safe in the knowledge that they have two years to use them. We have all been here!! You’ve not seen your family members in a few months and you have no idea what they’re into, what they like, interests etc. You’re checking their Facebook looking for ideas. STOP. Splash White Water Rafting and Activity Vouchers are the answer you are looking for, with over 250 five star reviews on Trip Advisor you can be guaranteed that your family and friends will have an excellent, fun and unforgettable time with us. They save money and time, YES, we know how precious time can be and the last thing you need is the pressure of finding that special gift, that will wow and makes an impact. So release the pressure and buy some – Splash White Water Rafting and Activity Vouchers. Its fast, it’s simple and it can all be done last minute. Click the voucher to buy or call 01887 829706 9am-9pm 7 days a week to order.